Eastleigh made it two wins in three days over the Bank Holiday weekend with a stunning five-goal victory at Bromley. Ronnie Moore's side continued where they left off having sealed a 2-0 home win over Solihull Moors in his first game in charge on Saturday. The Spitfires boss made two changes to his side. Reda Johnson, who scored with a towering header on his debut, was replaced by Adam Dugdale. James Constable also came into the starting line-up in place of Ryan Bird. Mikael Mandron hit a fine hat-trick as he put Eastleigh two-goals to the good at half-time and added his third, Eastleigh's fourth, after Jake Howells had made it 3-0 after the break. Adam Dawson netted a fifth for the rampant Spitfires to complete the rout. Dawson also assisted another two goals in the comprehensive victory. A goal apiece from centre-back pairing Ryan Cresswell and Reda Johnson saw Eastleigh seal a 2-0 home win in Ronnie Moore's first game in charge. Eastleigh couldn't have asked for much more as Moore and new assistant - Kevin Watson, both took to the dugout at the Silverlake Stadium for the first time. Two goals, a clean sheet and most importantly, three points - is an excellent way for the new boss to start his reign with the Spitfires. Ryan Cresswell, captaining the side put the home side 1-0 up from an Adam Dawson corner with the game approaching the hour mark. With a dominant and commanding defensive display on his debut, Reda Johnson capped off a fine performance to head home from a long throw-in by Michael Green. Ronnie Moore now takes his side to Bromley on Bank Holiday Monday on the back of this good 2-0 win over Solihull. Moore: "Let me handle the pressure"
Ahead of Ronnie Moore's first game in charge of Eastleigh, the new boss has said that he will "handle the pressure" allowing his players to just "go out and express themselves." Solihull Moors are the visitors to the Silverlake Stadium tomorrow with Moore looking to get off to a positive start. So far this season, Eastleigh have made a stuttering start to the campaign with a return of just four points from four games. Moore will be looking to stamp his authority on his new group of players and aim to find the winning formula to get the Spitfires' season back on the right track. It will be his first chance of course to name his first starting eleven and a good opportunity for the players to stake a claim for a regular starting spot in a squad brimming with talent. Centre-back Reda Johnson is likely to miss out on Saturday but he has an outside chance of getting some minutes at Bromley on Bank Holiday Monday. Eastleigh boss Ronnie Moore provides an injury update on his skipper Joe Partington. The Spitfires captain will be missing for the new manager's first game in charge this weekend when Eastleigh host Solihull Moors at the Silverlake Stadium on Saturday at 3pm. Partington, who was injured early in the season against Braintree Town, will also miss the Bank Holiday Monday trip to Bromley because of the Achilles problem that he is suffering from. Moore is also having to contend with injuries to Luke Coulson and David Pipe, who are ruled out with shoulder and ankle problems respectively. Ronnie Moore has brought in Kevin Watson to work alongside him at Eastleigh as assistant manager. Watson played for Moore whilst at Rotherham in a playing career of 23 years. The new man in at the Silverlake Stadium has previously been a coach at Luton Town and more recently had a spell with Stevenage - where he worked with Teddy Sheringham as assistant manager. New boss Moore says possession is key for Eastleigh EASTLEIGH'S under-performing players know exactly what they will be working on in their first week of training under new boss Ronnie Moore. For all their pedigree signings this summer, the Spitfires surrendered possession way too easily for the incoming boss's liking in yesterday's 0-0 Vanarama National League stalemate at Wrexham. To say that it's been a busy week for Eastleigh would be a huge understatement writes Jamie Montigue. A 4-2 home defeat on Tuesday at the hands of Dover Athletic culminated in Chris Todd losing his job as manager the next day. Two days later, former Hartlepool, Rotherham and Tranmere manager Ronnie Moore was called upon and appointed as the successor to Todd. 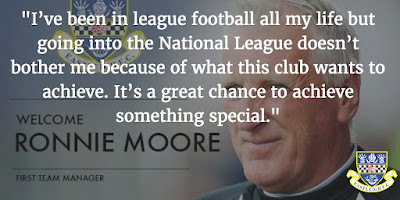 Moore will be looking for the Spitfires to get their season back up and running with promotion the ultimate end goal. His first full game in charge will be at home to Solihull Moors next Saturday (27th) at the Silverlake Stadium. A match that will be eagerly anticipated by many, not least by the new boss who will be hoping to hit the ground running. Moore: "A great chance to achieve something special"
Ronnie wants Moore players in his Eastleigh squad EASTLEIGH have appointed Ronnie Moore as their new manager - and he wants to sign three players by the end of the month. Moore, 63, is best known for winning two promotions with Rotherham to take them into what is now the Championship in 2001. With just four matches played and less than two weeks in to the 2016/2017 season, Chris Todd lost his job as manager of Vanarama National League side Eastleigh. The Spitfires, who have aspirations to get in to the Football League, came in to the new campaign as one of the favourites for promotion. Eastleigh FC have invested heavily in their squad once again thanks to the backing and support of chairman Stewart Donald. No fewer than twelve new additions arrived at Stoneham Lane over the summer. The club attracted big names from higher up the football pyramid boasting years of experience playing in the Football League. Click here to read Jamie Montigue's report looking back on Chris Todd's reign at Eastleigh and forward to a new era for the club under Ronnie Moore Ronnie Moore Announced As New Manager | Eastleigh FC After discussions with Stewart Donald, The Eastleigh Chairman commented, "I am delighted that Ronnie has agreed to join us and oversee the next stage of the clubs development. He brings with him a huge amount of experience and knowledge which along with the passion and commitment that has been clearly evident during our conversations made him the natural choice. 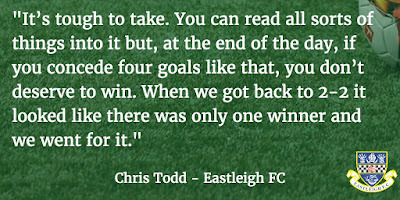 Eastleigh CEO says Todd's sacking was regrettable but necessary in a "harsh" leagueEASTLEIGH'S heart-wrenching sacking of manager Chris Todd was not a knee-jerk reaction to last night's dreadful 4-2 home defeat by Dover Athletic. According to the club's chief executive Mark Jewell, the decision to dispense with the extraordinarily likeable 34-year-old Welshman just four games into the season was based on his points return over a longer period of time. This is a disappointing time not only for myself but also my family. We are also a team and have been through much worse than losing my position as manager. We will bounce back again and look to the future with a positive attitude and a committed response to this setback. I would like to thank all players and staff past and present. Your help in developing me in management has been beneficial more than you probably realise. To Spitfire fans many thanks. I hope you remember the good times we had. You too have been instrumental in my learning curve. Can I thank Stewart Donald for firstly giving me the opportunity and also backing me throughout my time as manager. I have relished my time in charge of this very ambitious club and the challenges it has brought. I thank you all and I look forward to what the future brings. "Eastleigh Football Club can confirm that following a conversation with Chris Todd, he has been relieved of his duties as First Team Manager. "We would like to thank Chris for all his efforts both as manager and player. 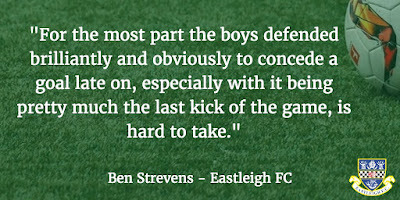 He has been a great servant to Eastleigh Football Club in what has been a hugely successful period. 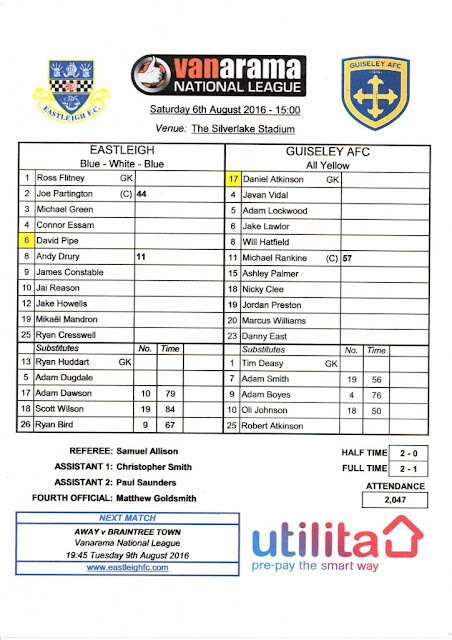 Eastleigh 2-4 Dover Athletic (with images, tweets) · eastleighfcEastleigh: Ryan Huddart, David Pipe (Jai Reason, 46), Michael Green, Jason Taylor (Ryan Bird, 75), Ryan Cresswell, Adam Dugdale, Jake Howells, Andy Drury, James Constable, Mikael Mandron, Yemi Odubade (Scott Wilson, 64). Subs: Ross Flitney, Ayo Obileye. Referee: Roger East Attendance: 1,854. Another Dover disaster for shellshocked EastleighFOR the second successive season a Tuesday night home game against Dover Athletic became a date with disaster for Eastleigh. Last October a 5-2 defeat at the hands of the Kent club spelt the end of Richard Hill's managerial reign. Injuries highlight holes in Eastleigh's squad EARLY-SEASON injuries to skipper Joe Partington and the versatile Luke Coulson have led Eastleigh to deduce that their squad isn't as deep as they thought. With 12 new signings arriving during the summer, the Spitfires looked set to sail smoothly into the new Vanarama National League campaign. Strevens: Tranmere defeat was "hard to take"
Eastleigh assistant Strevens says late Tranmere defeat was "hard to take" IT'S ridiculously early in the season to describe any game as a 'six-pointer'. But how ambitious Eastleigh could do with a home win over Dover Athletic on Tuesday (7.45pm) to counteract a mixed start to the Vanarama National League campaign. 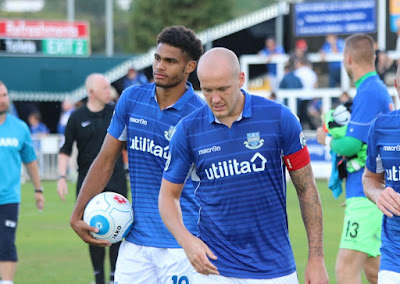 Eastleigh suffer first defeat - Tranmere win with last kick of the game (with images, tweets) · eastleighfc Eastleigh suffered their first defeat of the season away at Tranmere Rovers. 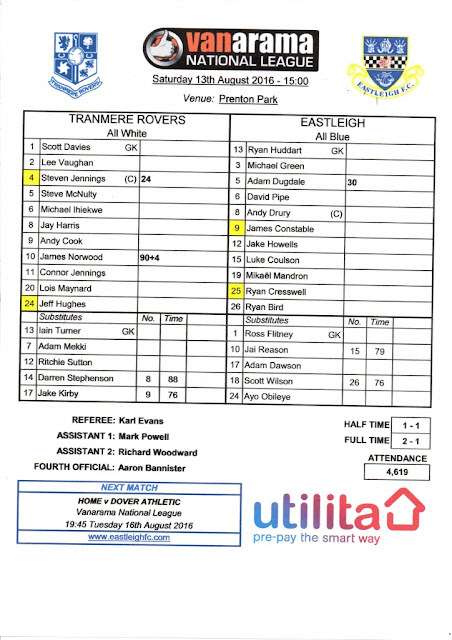 Late heartbreak for Eastleigh at Tranmere EASTLEIGH suffered last-gasp heartbreak in a 2-1 defeat at Tranmere Rovers this afternoon. Chris Todd's men fell foul of a dramatic late winner by James Norwood at Prenton Park to crash to their first defeat of the Vanarama National League season. Eastleigh FC secured yet another incredible signing last night announcing a deal for 28-year-old defender Reda Johnson. The announcement caused quite a stir and response on social media. Below you can read the best of the reaction as people heard the news. 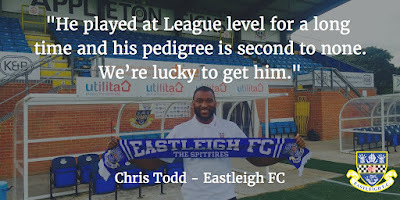 Reda Johnson signs for Eastleigh (with images, tweets) · eastleighfc Eastleigh Football Club are delighted to announce the capture of Reda Johnson. The 28-year-old Benin international joins Eastleigh on a two-year deal having parted company with Coventry City during the summer. 6ft 3in centre back Johnson, who can also play at left back, has spent the majority of his career playing in England. Eastleigh draw away at Braintree (with images, tweets) · eastleighfc Spitfires settle for a point on their travels as James Constable's opener is cancelled out by former Southampton forward Lee Barnard.Ex-Saint Barnard denies Eastleigh a second win EX-SAINT Lee Barnard denied Eastleigh a six-point start to the season by rescuing Braintree Town a 1-1 draw at the Avanti Stadium tonight. The Spitfires, 2-1 home winners over Guiseley on Saturday, set themselves up for a second victory when James Constable's shot took a heavy deflection off the Iron's Ian Gayle with 64 minutes gone. New signings have taken Spitfires to a new level - ToddTodd took over from former manager Richard Hill in late September 2015 as the Spitfires recovered from a lacklustre start to end the campaign in seventh position. Former Luton striker Ross Lafayette left earlier today by mutual consent after just one season with the Silverlake outfit, including a loan spell at Aldershot Town. Reserve Team Football Returns | Eastleigh FCEastleigh Football Club are delighted to announce the return of reserve team football for the 2016/17 season. The squad have been entered into the Wyvern Combination league where they will play the majority of their games on a Monday and Thursday evening. Todd: "We're up and running"
Eastleigh manager Chris Todd, discussing the Spitfires 2-1 win over Guiseley on Saturday, is pleased to get the season up and running with three points on the opening day. “It’s the first game of the season and everyone’s on edge wanting to get the three points and we’ve done that." Todd said. “It doesn’t matter how we played, we’re up and running now. “We were comfortable but then we got a bit shell-shocked by them scoring, switched off and let them into the game. “They had nothing to lose and you’ve got to give them credit for having a right go in the second half. “No game’s going to be easy and we’re delighted to get the points on the board. 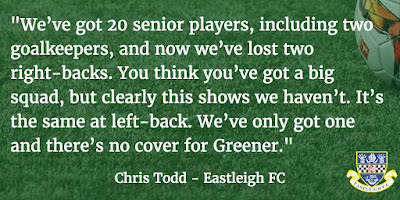 With 11 new signings added to the Eastleigh squad over the summer, Todd is pleased with how well the squad is looking.